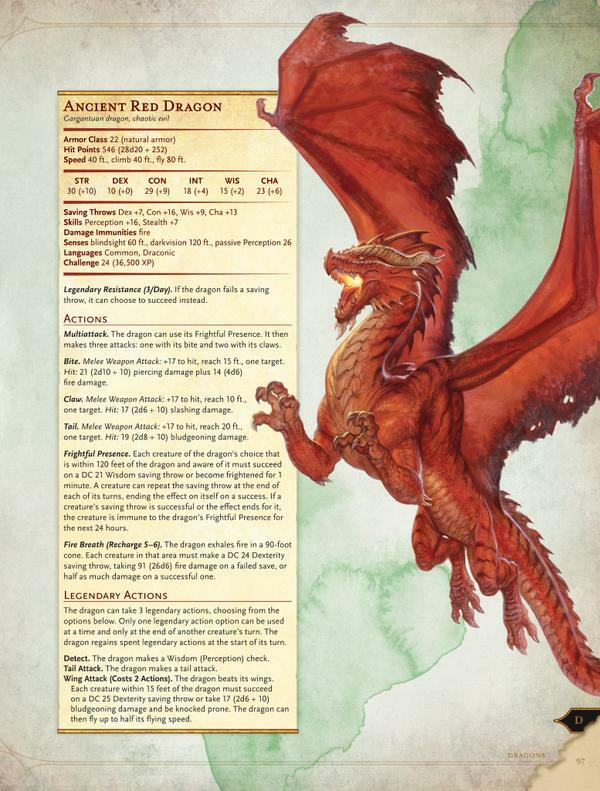 For a lot of Dungeons & Dragons players, the Monster Manual was the magical book that hooked them. 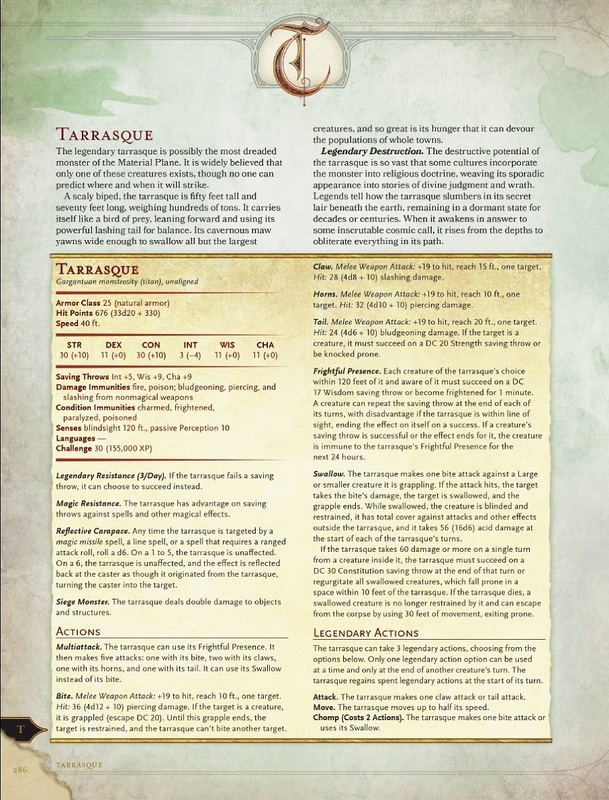 It's traditionally a tome of magic and wonder for young players, filled with strange beasts that defy description and written to appeal to the kind of kid that obsessively categorizes dinosaurs and devours tomes of mythology. 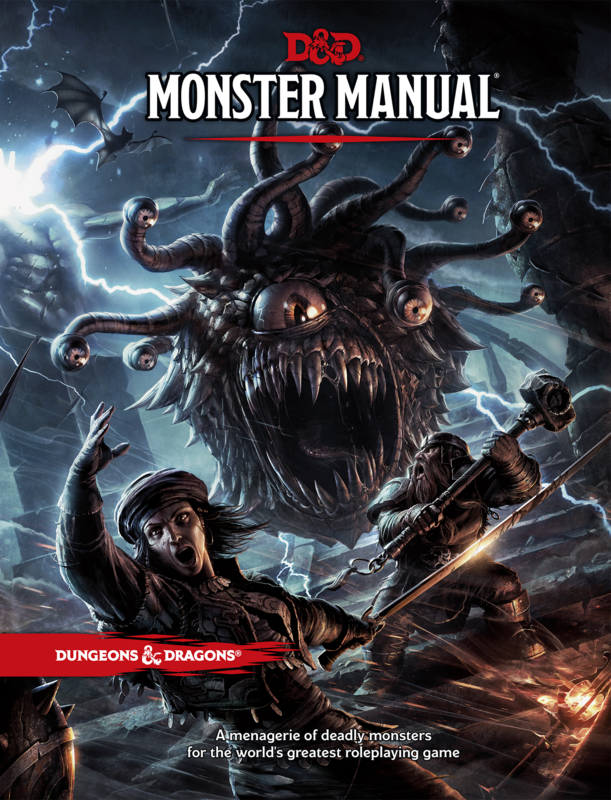 The Monster Manual for D&D's 5th Edition is a grand old book in that tradition, mixing game usefulness and a healthy respect for the mystery and purpose of its own contents. It's a bestiary in the grandest sense, and while it occasionally stumbles on rules, it innovates or succeeds in key ways that make the book more usable and valuable than many of its predecessors. The book is just as high quality as the Player's Handbook was before it, with just as good a binding and paper stock as you'd expect. The cover suffers from some small wrapping onto the spine, but it looks like that's because the decision must have gotten made to stuff in another fold of monsters. Some complaints will be made about the look of the books on the shelf getting disrupted, but nobody's going to value that over the added content. 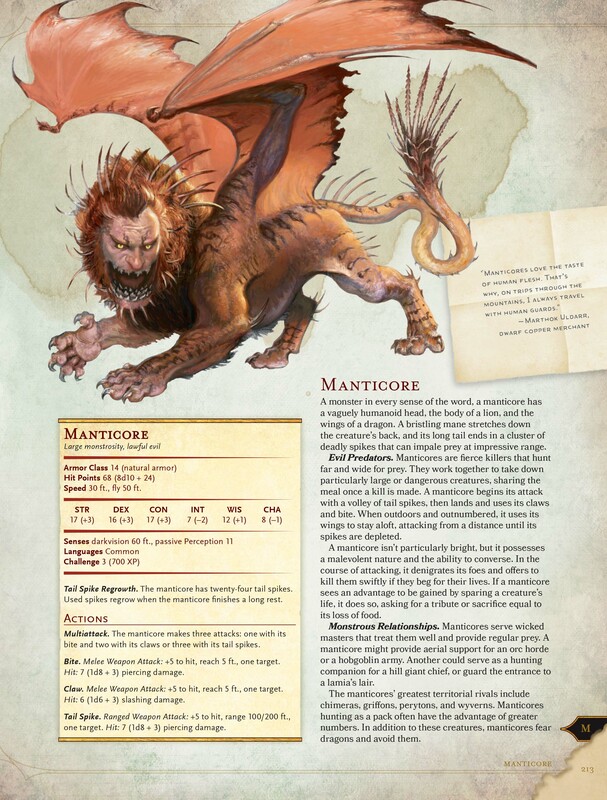 Only time will tell if the overstuffing means we see binding issues with the Monster Manual, but for the rough month I had with the book I saw none. The art and layout are generally gorgeous, with the beautifully handpainted style of 5th Edition taking the fore on many pages. Plenty of full page or half page splashes of art are included, giving the material the kind of space that it needs to thrive. There are a few stinkers in the artwork (I'm looking at you, fat Owlbear), but mostly they're great. The layout of the book is superb, with easy cues in the bottom right corners letting you know immediately which section of the book you're in. 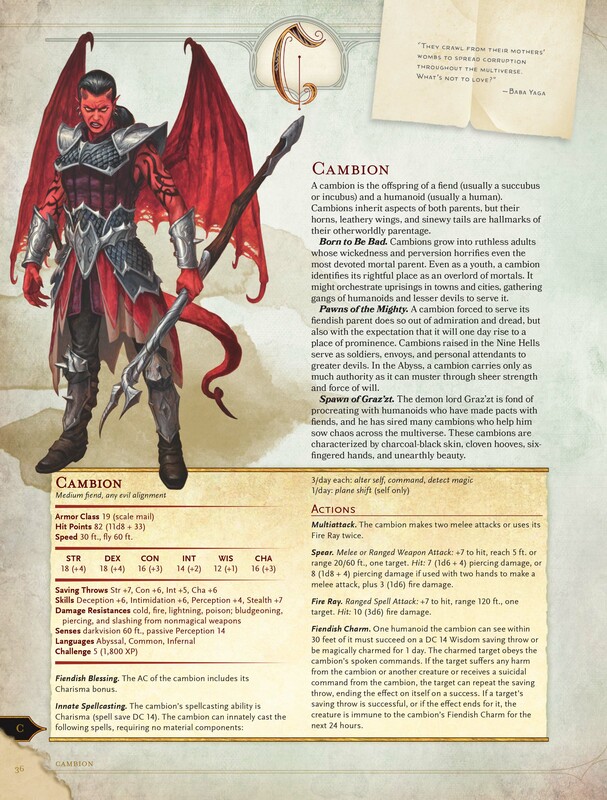 Monster stat blocks have all the usability of 4th Edition monsters, and sections that direct you outside the book for information are relegated only to monsters with spellcasting powers. The painfully lacking part of the layout was the decision not to include a "Monsters by Challenge" index. While it's a void that will inevitably be filled by fan supplements, it's odd and obnoxious that something the vast majority of DMs will print out and insert wasn't included. That said, the existing index of every stat block in the book by name is both complete and useful. 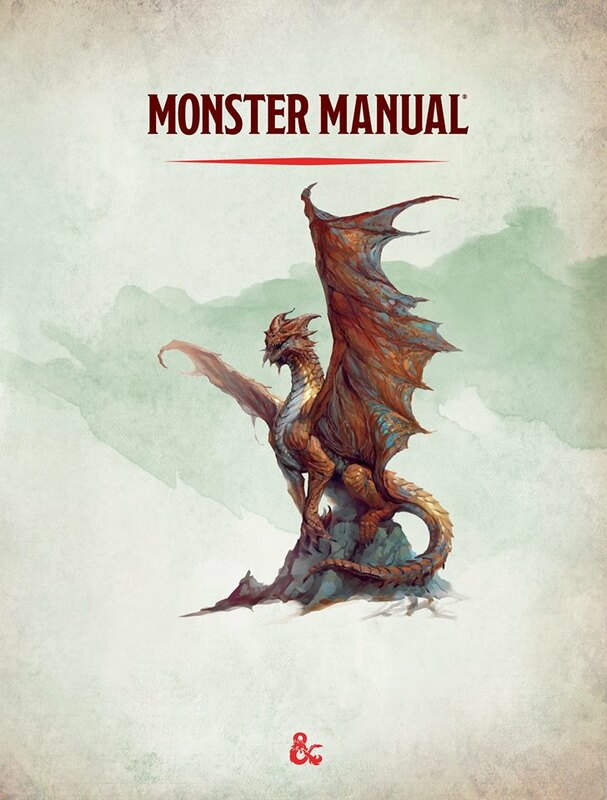 Packed with fascinating story and inspiring ideas, there's little to find fault with in most of the written words in the Monster Manual. The rules for monsters, meanwhile, are for the most part clearly written and decipherable, but occasionally complex wording can be frustrating. 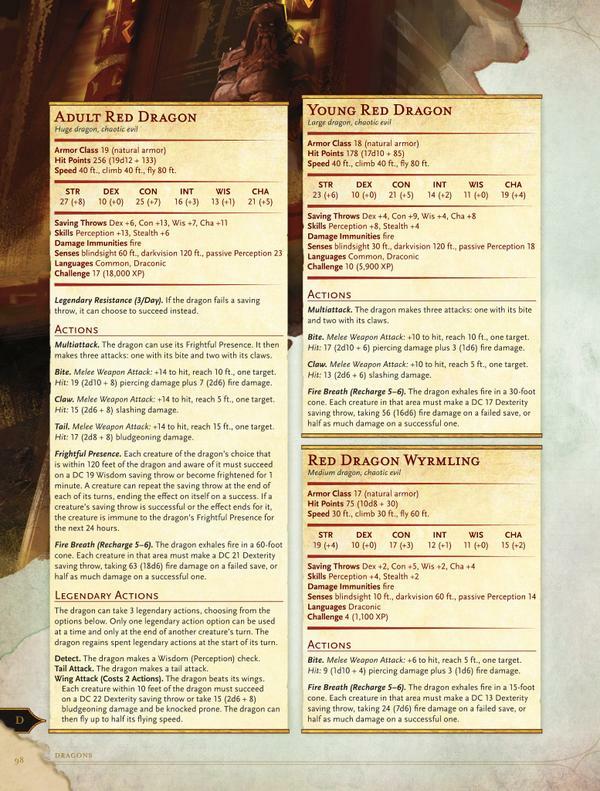 The monster stat blocks are a little strange to veterans of Dungeons & Dragons past, only bothering to note a monster's skill or saving throw if they're actually proficient in it. 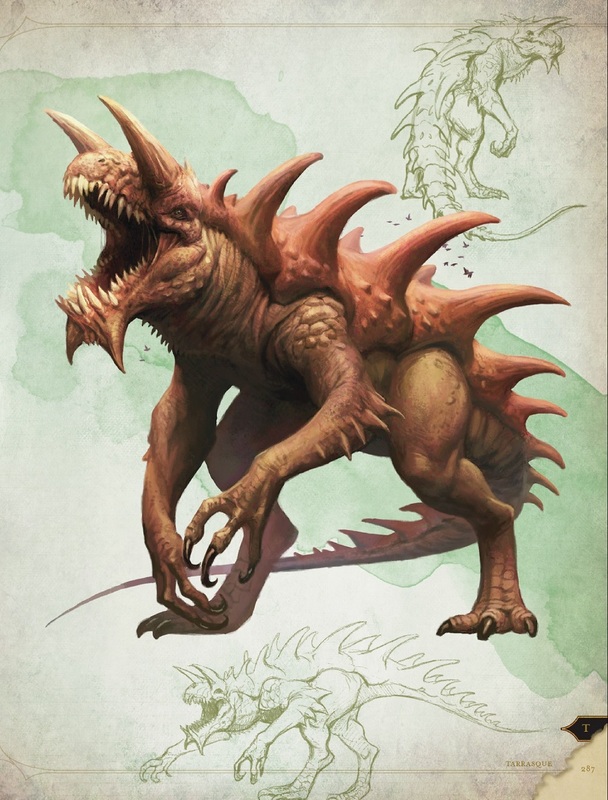 It's a little disconcerting at first, as most monsters aren't necessarily proficient in a specific save, so when you go looking for a monster's Dexterity save and don't even find the save line, you'll often do a double take before you realize you just have to rely on the creature's modifier. It takes a little rules knowhow to get used to the stat blocks and use the monsters. 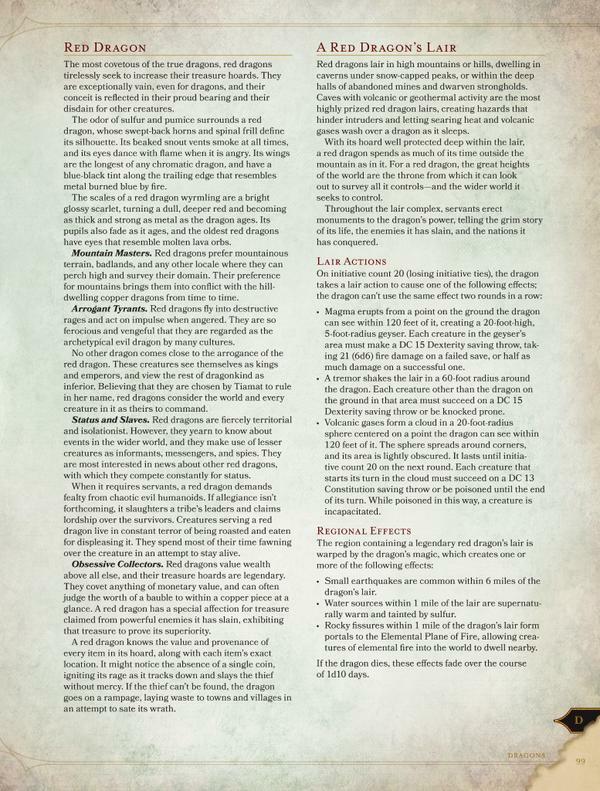 The new system for choosing when a monster is a suitable opponent for players is called Challenge, a number indicating at what level the monster should be difficult, but not a deadly fight, to a fresh party of four adventurers. 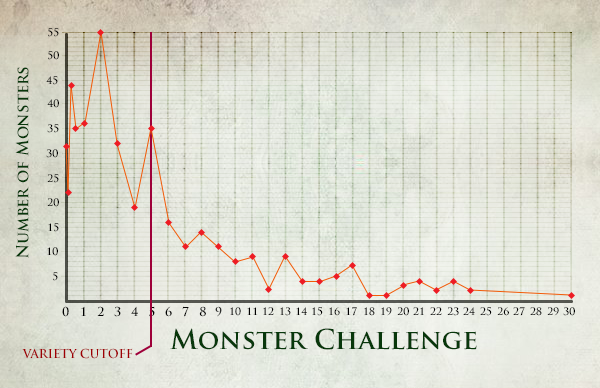 It's clear that while there's a mechanical basis for the Challenge numbers that monsters are assigned, there's as much art as science in whatever alchemy spits out that number. The monsters chosen for this book are also overwhelmingly skewed towards the lower quarter of the Challenge spectrum, covering thoroughly levels one to five before a variety cutoff that severely limits the kinds of enemies that higher level parties will face. If you consider this and the other two core rulebooks a complete game then the creatures available to you for high level adventuring will sorely disappoint you. It's mostly dragons and creatures from the outer planes like angels and fiends. That's not to say that what monsters are in this book - and to be clear there are a hell of a lot of them - are by any means uninteresting. There's a lot of variety, with the best of the old books represented: A cross-section of both fan favorites from older editions and forgotten oddities. 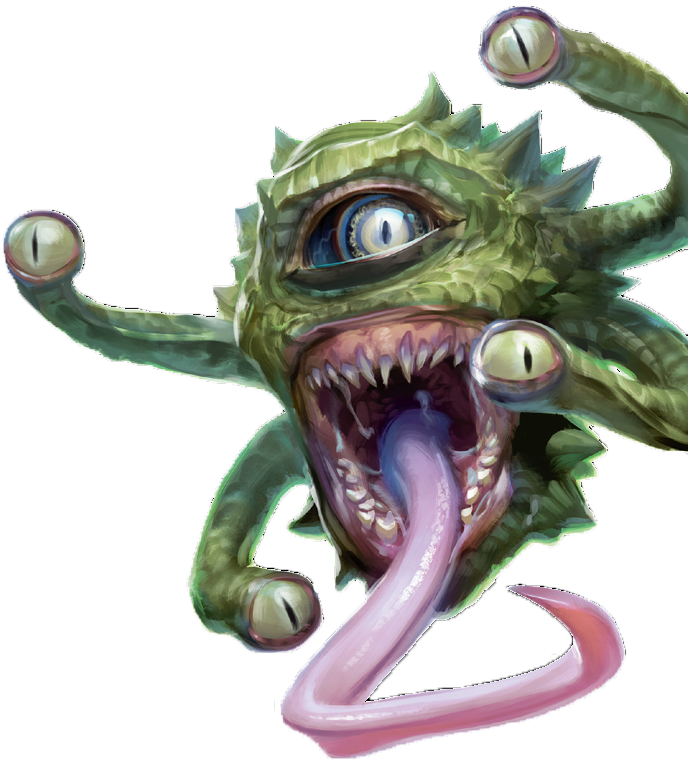 Each individual monster is dripping with fascinating details and seeds for adventures, with text accompanying every entry that alludes to worlds of adventures yet to be had and cues the DM on how the creature fits into the roleplaying aspect of the game. Even the opening of the book is loaded with adventure seeds, telling prospective dungeon masters about the kinds of environments that they might find monsters in. Beasts and Monsters have odd descriptions about the sort of ecologies that form around them. 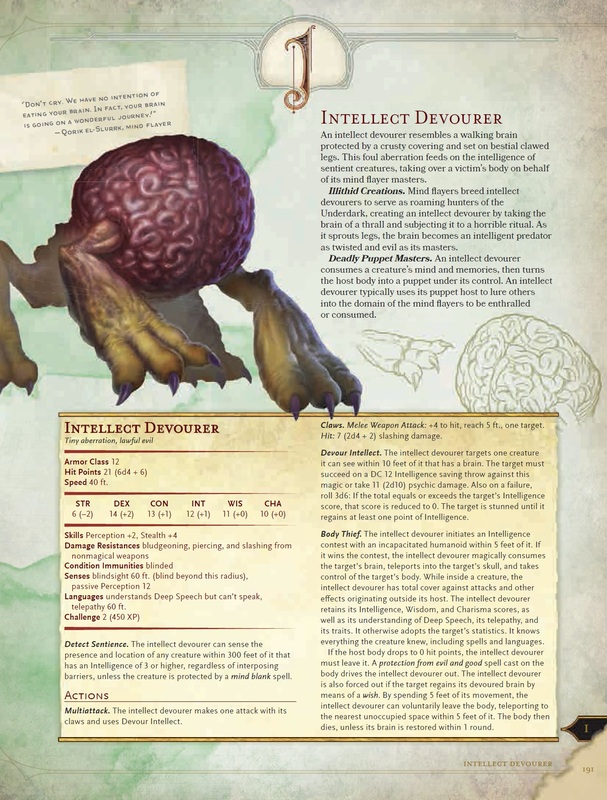 Intelligent creatures have notes on their gods and societies - loose descriptions that can be easily slotted into any fantasy world the DM chooses to run their campaign in but that mostly fit the D&D norm. Many of the intelligent beasts and humanoid enemies also have a handful of statistics blocks available, like a soldier, shaman, and chief for Orcs. Notably, though the Forgotten Realms are D&D's new default, they don't stand out as particularly prominent in this book. The books two appendices also bear mentioning. 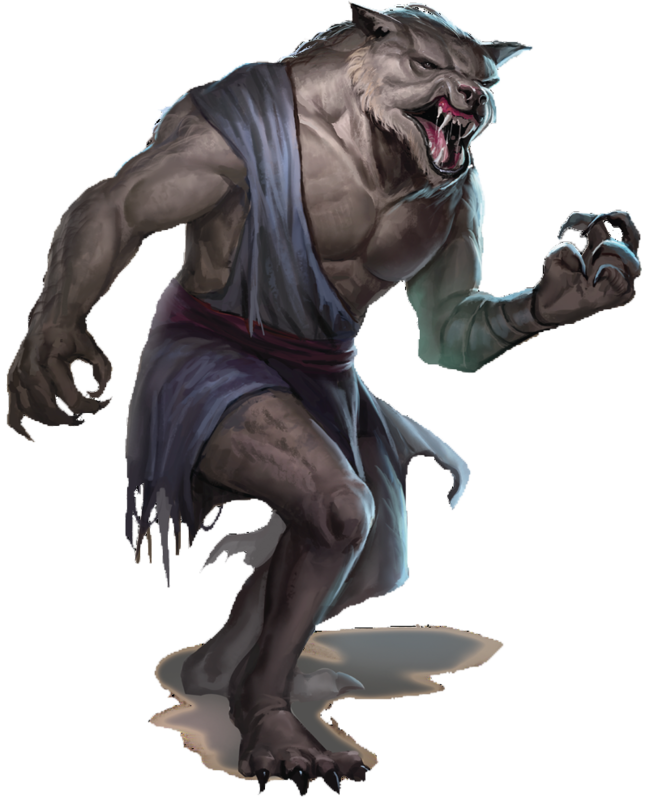 The first is a trove of 'normal' animals that occur in the D&D world, from natural things like bears and elk to giant spiders and blink dogs. They're monsters that didn't require a full page of description and it's good to see them presented in a format that respects page space. The second appendix is a surprise, but very useful, and contains a bevy of statistics for nonplayer characters - from bandits and archmages to priests and nobles. Like the beasts appendix, it's a concise and useful chunk of the book.